Lou and Gabrielle Childers created Wolfridge Resort over 20 years ago. The created a beautiful and peaceful place for families to enjoy the all the Methow Valley has to offer. Although they no longer manage all aspects of Wolfridge Resort, Gabrielle and Lou are still doing what they love best.....talking with long time friends and guests and taking care of them during their visit to Wolfridge Resort. Restoration of the warming hut, pool and hot tub are underway. The recreation property that contains the warming hut, pool and hot tub have new owners. Their energy, knowledge and leadership has already reaped many rewards with many more to come! Here is what we have been working on at Wolfridge Resort. *Solar panels are being installed to heat the pool. *The pool has been drained and is currently being painted. *We are hoping for a July 1 pool opening...we will keep you posted! Major clean up of landscaping. The cabin owners pitched in to remove and trim trees. 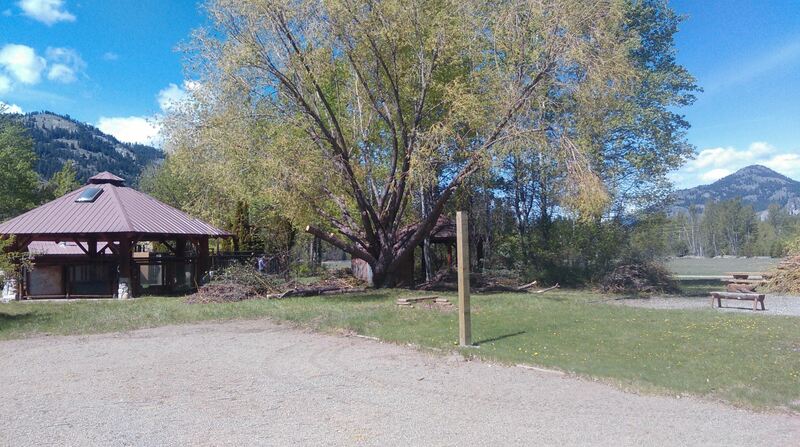 The landscaped areas around the beautiful log structures have been cleared and improved. The play structure has been re-built. Once the pool is up and running, attention will be turned to the hot tub. 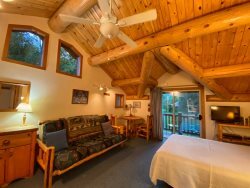 The hot tub has the iconic log structure and rock surround that is the pride of Wolfridge Resort. We hope to have this up and running before winter sets in. We are very excited about the improvements and changes that are going on at Wolfridge Resort!! Come visit this summer!